Paris is a chic city—there is no doubt about it. Sit in a café and people watch and you will see Parisians stroll by looking like absolute fashion plates. It’s no surprise then that Paris has some of the best shopping in the world. Many have written about places to buy clothing, so I’m going to provide a Paris shopping guide to some of the other wonderful items one can purchase in the city of lights. When I’m traveling, I generally don’t allocate time to go out and shop. Instead, I scout out retailers of interest beforehand and if there is time will stop by a store when I’m in its area. This shopping guide then is set up by arrondissement and/or places of interest—it acts as a travel guide to some great Paris stores and shopping areas. After spending hours roaming through the Louvre, it’s difficult not to want to own some of that amazing art for yourself. Luckily, there is a top notch store nearby, Le Louvre des Antiquaires, featuring many different vendors offering jewelry, collector’s items, paintings, objets d’art, and other treasures (2 Place du Palais Royal). While in the area, you may want to stroll over to the famed Palais Royal gardens. There are some interesting little shops at the Palais Royal, but one cannot miss the chance to visit one of Paris’s famed covered galleries. Galerie Vivienne is nearby and absolutely enchanting. Constructed in 1823, the architecture of this shopping arcade is truly charming. Sun shining through the glass ceiling highlights the tiled floors forming celestial mosaics below. Various boutiques, a bookstore, a tea shop, and cafes offer a mélange of goods (6-8 rue Vivienne). Stop by Galerie Colbert (2 rue Vivienne) to see an elegant dome on your way to stylish Place Vendome. With stores like Tiffany, Chanel, and Goyard, you may just shop until you drop. Thankfully, the Tuileries gardens are right next door with elegant benches to rest upon while enjoy the scenery. If you still have a little pep in your step, the fabulous Musee Orangerie with Monet’s famed “Waterlilies” is located on the far end of the gardens near the Seine River. One of my favorite areas of Paris is the trendy area known as Le Marais. Not only can you explore Victor Hugo’s mansion, view a medieval home, explore Paris’ Carnavalet Museum, and see one of the finest city halls in all the world, but you can also visit great shops and find wonderful riches from the past. If you start at the river, you may want to wander down rue St. Louis on the Ile St. Louis (island in the Seine near the one Notre Dame is on). I found great gelato there at Amorino (47 rue Saint-Louis), but Berthillon (31 rue Saint-Louis) is wonderful too. My recommendation? Try both. Moving over to the Marais there are so many great shops that I can’t list them all. Some good areas are rue St. Paul, rue des Francs Bourgeois, and rue de Rivoli. I found delightful outdoor antique sales in the Village St. Paul area. At 51 rue des Francs Bourgeois, I experienced the historic parfumeur Fragonard. Their scented goods are at fairly decent prices; I purchased a divine perfume—its floral scent always reminds me of a Parisian garden—and several gifts for those back home. There are several Fragonard locations around the city—the rue Scribe location even has a perfume museum. Another alluring scent shop is Nicolai at 45 rue des Archives; her home scents continue to perfume my rooms. 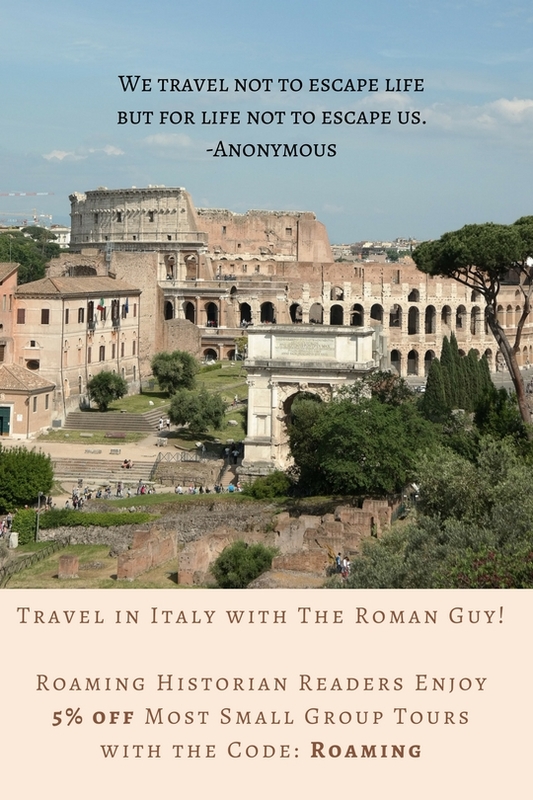 Most travel guides will warn you to avoid the 5th area as it is tourist haven. It’s true that there are a lot of tourists in this area, but with good reason—it’s centrally located with lower prices than its ritzier neighbor, the 6th. I love exploring the bouquinistes along the Seine (near Notre Dame). These riverside book stalls with their characteristic green color are an endless source of entertainment for me. They are basically green boxes and owners only pay for rent for the land upon which they sit (which isn’t much at all). There is a years-long wait to own one since they have such low rent and upkeep—just green paint and sturdy locks for when the doors of the stall are closed. The low overhead translates to generally lower costs for patrons. You can buy antique books and ephemera, used books, posters, paintings, prints, photographs, cheap Eiffel Tower keychains, and much more. Across from the stalls is a bookseller of some renown—the famed Shakespeare and Company. This English-language bookshop is in the heart of Paris and is known as being a haven for intellectual expats. 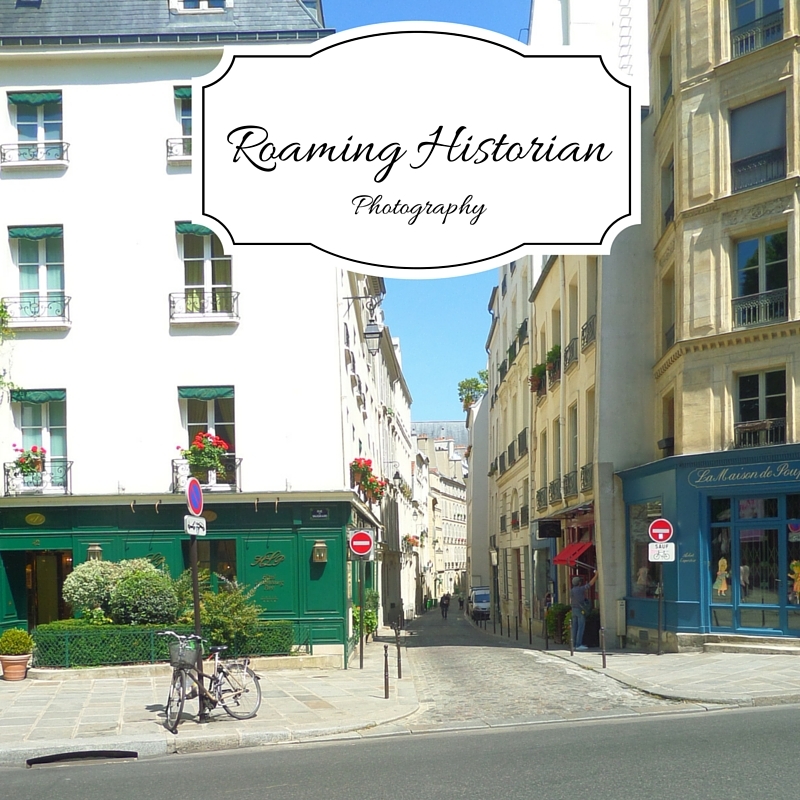 Speaking of intellectuals, the 5th arrondissement is home to the Latin Quarter-the educational section of town named for the Latin spoken and studied at the nearby university. Check out the lively Rue Mouffetard market street, which Ernest Hemingway talked about in A Moveable Feast. This pricey district with big boulevards and charming lanes has a lot of different antique shops. While last there, I found a wonderful outdoor antique market near Saint-Sulpice church. I couldn’t believe the ages-old, fragile objects that dealers exhibited under their white tents. Lots of art and antique dealers congregate at Carre Rive Gauche (Left Bank Square) an area bound by Quai Voltaire, rue du Bac, rue de l’Universite, and rue des Saintes-Peres. If antiques and art aren’t your cup of tea, you can also find loads of swanky shops on the Boulevard Saint-Germain. When in the 7th, make sure to save time to stroll Rue Cler and enjoy its cafes and food vendors. I love the way the street sounds and looks. As I listen to locals discussing the best food choices for dinner, it makes me wish I lived in Paris. Grocers will offer you the freshest fruits and vegetables. I adore the small, torpedo-shaped, French strawberries, when they are in season. They are so sweet you will swear they are candied. Make sure that they are the ones from France though. Just like in the States, grocers offer produce from other countries. Fromageries sell a fragrant selection of cheese; let your nose do the ordering. The French are known for their creamy Brie. Pick up a crusty baguette from the local boulangerie. If you’re staying in a place with a kitchen, you might want to stop by the butcher and pick up something nice and meaty. If no stove is available, consider some ham to go with that bread and cheese. 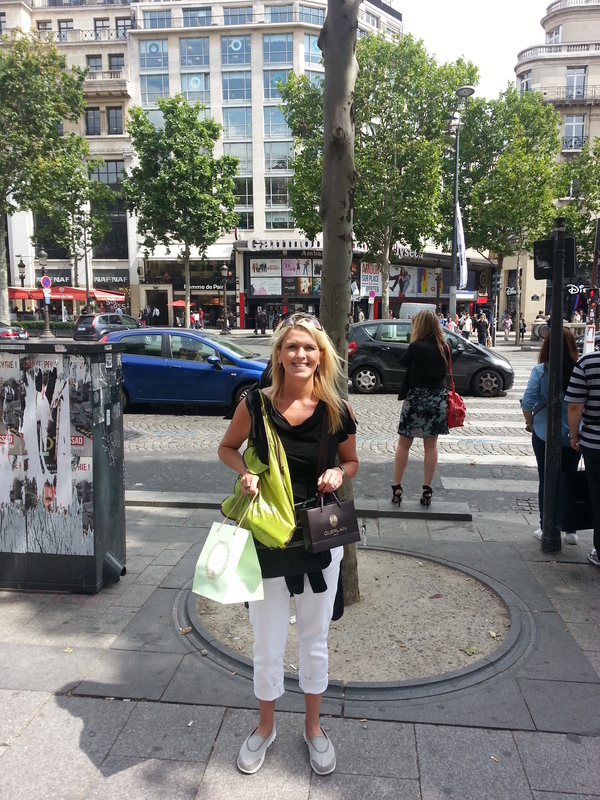 A trip to Paris probably wouldn’t be complete without stopping by the illustrious Champs-Elysees. Although most of the stores are the same high-end retailers you can find in any big city, it is so conveniently close to the Arc de Triomphe that a little stroll down the grand boulevard is easy enough to do. For less expensive bath and body products, stop at Yves Rocher. For a truly decadent dessert experience, stop by this location of Laduree. The macarons are worth their weight in gold (and cost almost as much). I also enjoyed a chocolate confection there. 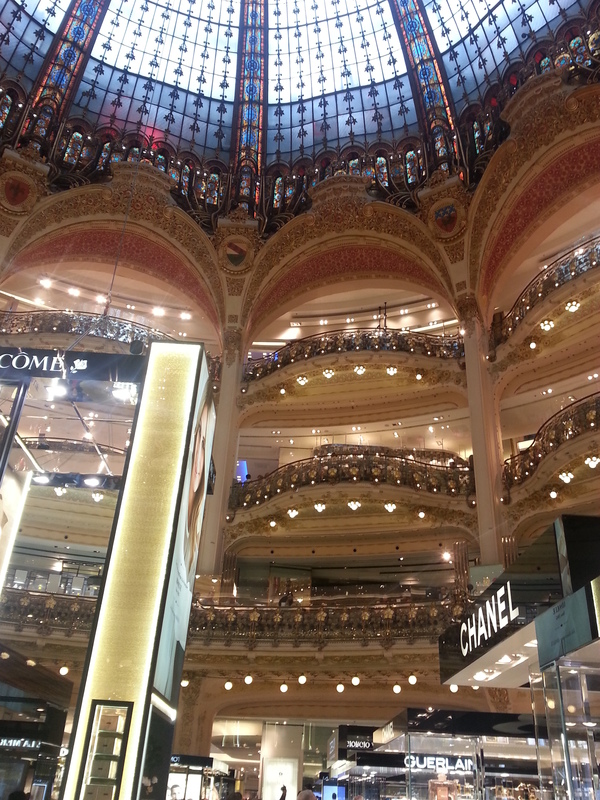 Near the opera is the historic Galeries Lafayette on Boulevard Hausmann, which is worth a trip just to see its atrium. Standing under the circular rotunda, one looks up at balconies marking each floor. The rotunda is capped by a stained-glass dome. Each floor’s balconies remind me of “boxes” at the opera. The store sells cosmetics in this area, and a grander space to buy make-up perhaps does not exist. 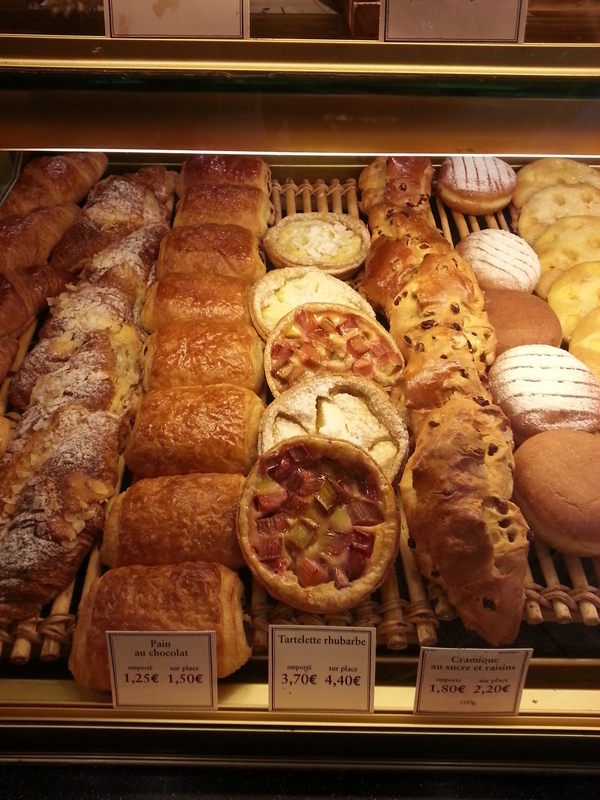 While shopping in Paris, there are a few items that shouldn’t be missed. If you can, pick up Maille mustard. It is divine. I love to have it on steak the way the French do. If you have a sweet tooth, Parisians make caramel like no other. Buy one (or twenty) of the charming little glass pots filled with this sugary concoction. You haven’t lived until you’ve tasted this rich, chewy delicacy. Another delight are DeliChoc cookies, which can be found for cheap at any grocer. They’re a delicate biscuit with a dark chocolate coating one side—a perfect blend, not too sweet, but not too plain. French pharmacies just seem better than any other pharmacy. Even though many of their beauty products are now available in the States, they’re cheaper in Paris (I never thought I would write those words). Stockpile Embryolisse Lait-Crème Concentre, which is a rich cream that can be used to moisturize skin, remove makeup, and soothe skin irritations. Bioderma Cleansing Water feels great on the skin. I didn’t notice any change in my skin from its use, but it was inexpensive and made me feel good so there is that. Lastly, Parisians know lingerie. Etam is an inexpensive retailer that offers good-looking lingerie at decent prices. They’re located around the city. I hope that you have a fabulous time shopping in Paris, France. If you have any tips for stores to add to my Paris shopping guide, please let me know! I also would love to hear about cheap shopping in Paris. Bon voyage! Going to France? 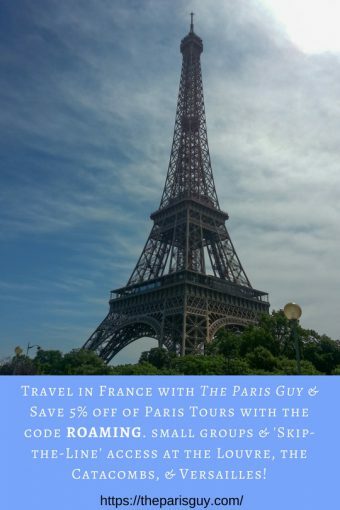 Roaming Historian readers can save money on The Paris Guy tours. Enjoy their small-group Paris tours and skip-the-line access at the Louvre, the Catacombs, & Versailles. Just use the code “ROAMING” when booking to save 5% off.